This is a special time in the life of a TV show that can only be experienced once, the final week leading up to the series finale when all remaining questions will be answered at last ... or not. But either way, the door will close for good. So this is the last, best chance you have to make a prediction as to how it all ends. 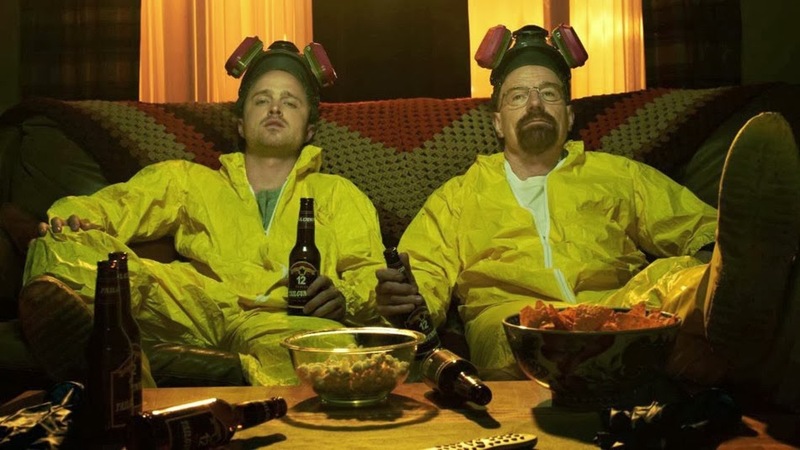 "It" in this case is, of course, the Breaking Bad finale set to air on Sunday, September 29th. I have to admit that this is my absolute favorite time to be a devotee of a series. When the pieces are all laid out on the table and you think you have a pretty good idea how the final picture is supposed to look, and yet ... "And yet" is that gnawing sensation that something amazing is waiting out there just over the horizon, something you can't quite see from your current vantage point. It's the essence of anticipation, when the lines of expectation and the potential for surprise crisscross on the graph of the mind. This past week saw the release of Star Trek[:] Into Darkness on DVD/Blu-Ray, which gave us all an opportunity to reflect on the visceral hatred that movie set off among Trekkies and critics alike. Seriously, it's gotten pretty ugly. Like, Prequel Trilogy ugly. So ugly that the attendees of a recent Star Trek Convention in Los Angeles voted Into Darkness as "the worst Star Trek movie ever." I've expressed my own issues with the film's bogus marketing tactics (which I believe amounted to a cynical manipulation of "spoiler" etiquette), while others have brutally taken down the film's narrative shortcomings. What is out there in the black void beyond? How do you recapture that spirit of exploration, that optimism for the future from the cynical, gritty, action-oriented "nuStar Trek" universe they've created? 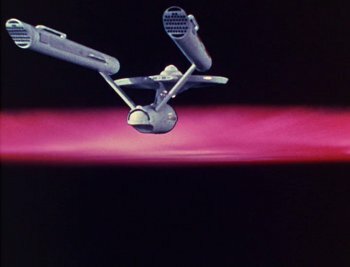 I can't tell you how, but I can recommend a handful of movies (and one TOS episode) that I hope the writers and director watch before they start banging out the plot for Star Trek Course Correction (which I think would make a great title). I've started to notice that any time I've seen the trailer for the new Nelson Mandela biography, Mandela: Long Walk to Freedom, it's been paired back-to-back with Captain Phillips, the Somali pirate movie ... I'm not suggesting that this is deliberate, per se. But there probably is some trailer distribution algorithm (the same algorithm that prevents the Hangover Part III red band trailer from playing before The Croods) that is lumping together Mandela, the movie about the Nobel Prize laureate head of state, with the scary African pirate movies. I get why this happens. It's a marketing decision and it's no surprise that it's going to be hamfisted at times. Still, the algorithm got a little out of control before Fruitvale Station, which I caught a few weeks back and highly recommend (whenever you're in the mood for devestating). It's the recreation of the tragic last day in the life of African American Oscar Grant. And judging from the trailers they lumped together before the movie, the trailer gods apparently figure if you've decided to see a movie about a black man, you'd probably like to see every movie starring African Americans coming out this year. Here, for your viewing enjoyment, is the sequence of trailers (which is only missing a Tyler Perry film -- they must still be cutting the trailer for Tyler Perry's A Madea Christmas). I am a devoted fan of The /Filmcast and I deeply appreciate the way that David Chen, Devindra Hardawar and the rest leave any discussion of "spoilers" till the end of their reviews. I've frequently listened to the first half of reviews for movies I hadn't yet seen, and held off on listening to the "spoiler" portion until after I'd seen the movie in question. Now, I generally agree with their approach to "spoilers", that is, treating any plot detail as a spoiler unless it had already been revealed in a trailer or commercial. However, in a recent podcast of The Ones Who Knock ("TOWK"), David's spin-off podcast with Joanna Robinson, they took things a step further by treating the title of an episode airing the following week as a spoiler. At the time, I took the "spoiler warning" to heart and did all I could to avoid learning the title until after I saw the episode. In retrospect, however, I think that was a mistake. That experience left me thinking about "Spoiler Orthodoxy", which is what I'm calling the perspective that any piece of information that reveals plot details of any sort is a "spoiler." I think it's time we reconsider what constitutes a "spoiler", and maybe push back against the Spoiler Orthodoxy when it takes control out of the storyteller's hands and treats all plot details as "spoilers" without differentiation. In fact, I'll go a step further and say that "spoiler warnings" can create false expectations that may even harm the viewing experience (particularly when the system is abused for the sake of marketing alone). More below the fold, and (yes) "spoiler warning" for the latest season of Breaking Bad, the fourth season of Venture Bros. and Star Trek Into Darkness.